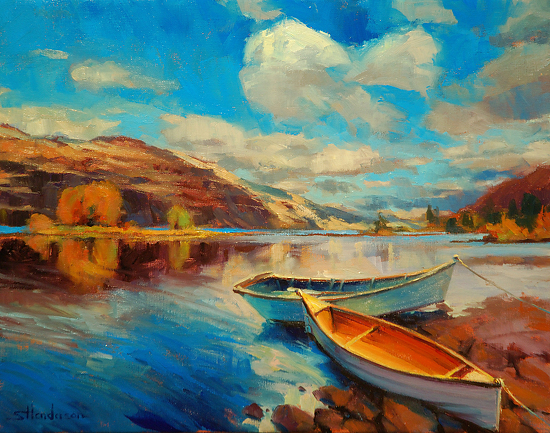 Autumn Sail Original has been accepted to the 33rd Annual International Maritime Art Exhibition at Mystic Seaport, CT which begins September 22, 2012 and runs through December 31, 2012. The original is available for sale for $2400 — it can be purchased directly from the site for now, and you are more than welcome to contact us via carolyn@stevehendersonfineart.com to arrange an interest-free payment plan. In addition to the original, high quality, archival, signed limited edition prints are available — framed and unframed — in varying sizes and prices with shipping, as always, being free. Note Cards and an original, framed miniature study round out the options for this work. And where is this place? The river is the great Columbia — the great natural highway to the Pacific Ocean — that borders between Oregon and Washington in the scenic Columbia River Gorge. The peaceful, sleepy town in the background is White Salmon, the day overcast yet still warm, the season autumn, and the feeling one of quiet contemplation on a weekend afternoon that belongs to you, just you, with no obligations, deadlines, unsolicited phone calls, or overflowing in-box, whether it’s on your desk or desktop. Limited edition of 200 in each size of limited edition print on archival quality paper. Signed by the artist.